Will City Hall Get on Board With Extending Parking Meter Hours? Giving away free curbside car parking when it’s in demand on Sundays and evenings just doesn’t make any sense. The point may feel somewhat belabored to Streetsblog readers, but it’s highly relevant at the moment and hugely important for the city’s streets and transit system. Political momentum to end the traffic congestion and dysfunction caused by unregulated parking on Sundays and evenings finally seems strong as the measure comes up for approval next month in the SFMTA’s two-year budget. Although rationalizing curbside parking throughout the week still faces opposition from some church leaders and other members of the public, key SFMTA decision-makers and stakeholders seem to be on board, for the most part. But it was only two years ago that then-Mayor Gavin Newsom pressured the SFMTA Board of Directors into ditching the idea. And Mayor Ed Lee has indicated that he might do the same. While the political climate among city supervisors is unclear, the policy has mostly met with support this time around from SFMTA Director of Transportation Ed Reiskin, the SFMTA Board of Directors, an advisory panel of community stakeholders, and the members of the public who have attended the three town hall meetings on the SFMTA budget so far. Reiskin told Streetsblog that although he doubts “the general public at large would necessarily be supportive” of the policy just yet, support from those groups “will weigh heavily” on whether it goes through. In a study released in 2009 at the request of city supervisors, SFMTA staff recommended enforcing parking meters on Sundays and weeknights past 6 p.m. (in some districts). Sunday and evening metering is already policy on Port property (including Fisherman’s Wharf) and in many other American cities, including Los Angeles, Miami Beach, and Portland, OR. In some cities including Chicago, Old Pasadena, and Tampa, FL, meters are in effect until 2 a.m. or later. “There’s not much justification for us not to manage parking on Sundays when businesses are open,” said Reiskin. Recently, the vocal opposition to metering on Sundays has mostly come from churches whose driving members have long benefited from an unwritten exemption from parking enforcement on Sundays, allowing them to co-opt traffic lanes and bike lanes as free parking lots. By this logic, people of Jewish faith, who worship on Saturday, already aren’t welcome in San Francisco. Neither, for that matter, are all churchgoers who pay the same price to ride the bus on Sundays that they do the rest of the week. As transit advocate Fran Taylor pointed out, religious leaders haven’t stepped up in the same way for their transit-riding members. “Where were all the pastors when Muni cut service and raised fares, suggesting that people of faith (and everyone else on the bus) aren’t welcome to go to work, school, doctor, church, [and the] grocery store…?” Taylor wrote in response to the Examiner story. More to the point: Metered parking on Sunday is going to make life easier for church-goers who drive, for the same reason it makes life easier for shoppers who drive — by encouraging the turnover of a limited supply of parking. Metered parking will open up more convenient, legal parking spots for visitors without slowing down Muni or endangering people on bikes. Proponents have also pointed out that fears of having to leave a service to feed the meter could be addressed by extending (or elminating) time limits and providing easier methods of payment, which the SFPark program is doing. At the SFMTA’s town hall meetings so far, opposition to extended meter hours hasn’t materialized, and it has even seen some support. While the discourse in the media often frames the measure as nothing more than a money grab, Reiskin emphasized to attendees at last night’s town hall that it’s more of a way to improve how the streets function. Metering parking on Sundays is only expected take in $2.8 million per year, and evening hours $9 million (together, just over 1 percent of the SFMTA’s budget). Still, when it comes to raising revenue or cutting costs to close the operating budget gap, he said it comes down to “the parking or the transit.” Muni riders have been burdened with fare hikes and cuts to service and vehicle maintenance in recent years, even as the city continues to let private auto drivers circling for free parking slow down buses during unmetered hours. Just personally, I might like to see *evening* meters in active commercial districts implemented before tackling the Sunday issue. Areas like the Mission, Fillmore Street, and the Marina are hopping at night- what’s the logic for free parking after 6pm? Is this a photo of cars circling to find a parking space? It looks a lot like the line of cars waiting to get up to Coit Tower. Evening meters on 24th Street in Noe Valley would be extremely useful. Like clockwork, at 6 PM the metered spots lock down with overnight parkers, and the dance of cars impeding traffic waiting to get into the Whole Foods begins. Of course, the same problem is also very acute on Sundays. And the only church within a block of the commercial district *owns* a parking lot that is never full so they really can’t complain. It isn’t logical anymore. They haven’t changed the meter hours in over half a century. Back then there wasn’t demand for parking in the evening or on Sundays. One concern cited by residents (who park on the street) is that evening meters would make it harder for residents to find a spot to store their car at night, since they can’t use the metered spots, and because visitors may be more likely to look in the neighborhood for free spots. I don’t necessarily agree with this logic, and certainly don’t think anyone has a right to a free (or deeply subsidized) on-street space, but there is a possible solution if it is a problem: run the meters past 6, but increase restrictions on visitor parking immediately outside the metered zone, i.e. by implementing a 15 minute time limit, or banning parking altogether, except for people who have permits. Combined with demand-responsive pricing, that should give you a main street with good parking availability, and side streets that don’t have visitors circling around looking for free parking. Pretty much everything just outside 24th Street is RPP already. And frankly, someone from another neighborhood who comes to Noe Valley to shop or go out to eat will fade the $2/hr to park on top of $120 at Whole Foods or several $10 glasses of wine. People coming from inside the neighborhood can walk 4 blocks or pay. Fooey. Sunday and evening metering should be seriously considered, and people need to realize with SFpark, the City has the opportunity to create a considerate parking policy. If approached in a respectful manner and giving consideration to parking demand, they could implement a congestion based pricing through say 9pm or whatever time makes the most sense, but to alleviate concerns, they need to emphasize the longer hours that do not disrupt your dinner and entertainment. People dont like paying more when they never had to before, but if they dont like it they dont have to drive and pay. People will still come and shop and eat as they do on any other day. Extend the meters on 24th, but also make all streets 2-3 blocks within 24th and Church St RPPs. Then you have a solution that increases turnover and gives the residents somewhere to park their car at night. Hell, I just wish they close 24th St entirely to cars on the block with Whole Foods. It, along with 18th St between Dolores and Guerrero, is a perfect candidate for this. I know it’s basically an impossibility, but it can’t stop me from dreaming …. I think the first step should be Sunday metering and extended hours in commercial/tourist areas. That *does* make sense particularly with the goal being revenue generation via tickets rather than any other platitude. However, none of these concepts are worth a dime if something isn’t done about the too-numerous issues of disabled tag abuse. With easier payment methods and changes to the metering paradigm there is no excuse for those people to pay for their parking. There should be no free-pass or additional subsidy. 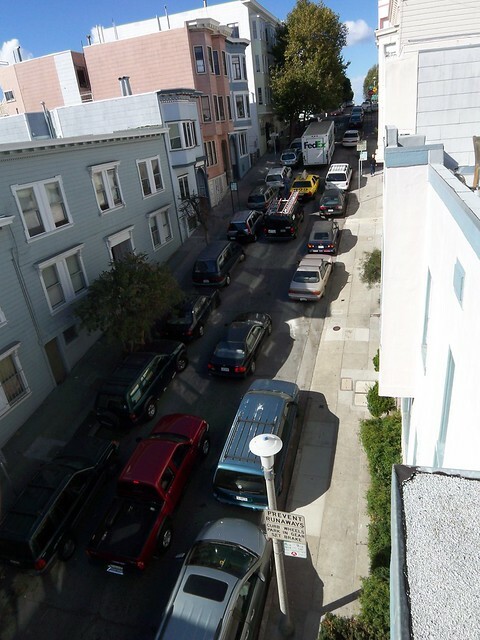 If you look at many areas, including S. Van Ness in front of MTA, whole rows of parking spaces can be taken up by blue tag cars (or city vehicles – which should be parked in city lots). Let’s make intelligent changes, rather than cobble together mediocrity to pander to minority interest groups. I didn’t realize this was such a pro meter blog and I can’t really understand why except for the animosity folks have for cars and it comes down to soaking the car drivers. The ruse about more parking opening up due to meters and how wonderful that is for drivers is simply a nice way to say F U to drivers. In California, transit advocates and environmentalists have few viable ways to level the uneven field of transportation.modes. Super majorities are needed to increase taxes, including gas taxes, or implement new taxes (like a vehicle miles tax). San Francisco recognizes the negative impacts that large numbers of automobiles have on the city. Street space is limited and real estate is exceedingly costly. Charging more or more often for on-street parking is one of the few ways that a forward thinking California city can attempt to address this issue locally. When one objectively looks at the seious environmental and health consequences of our car culture, how can one deny that more needs to be undertaken to change course? Of course it will be inconvenient to have to start paying for something that we consider to have been free, but it’s a small price to pay for the impact our cars have on our city, our health and our global environment. I wouldn’t say it’s about saying F U to drivers. It’s more about the fact that parking takes up huge amounts of available space, in some cases incredibly valuable and in demand space. Why should only a certain number of people get a free pass to that space that could be put to other uses like more vehicle, transit, or bike lanes to help everyone get where they’re going faster? It costs money to maintain parking, so the users of that should contribute to the associated costs. Totally agreed fsinsf. Shouldn’t the default setting on policy make it EASIER on residents, not more difficult and more expensive? I don’t know of any businesses who support a 9PM or 11PM metering system. Where are these people MTA says support this crazy notion?? They would lose substantial business because people will go elsewhere. It’s basic economics, make something more expensive and people won’t buy it. And another thing, why should a resident, who already pays taxes for these services, and might also very well pay significant taxes as a homeowner, then be forced to feed a meter for 3 hours ($6, $9) every single day just to park their car after work? It’s total lunacy to suggest that this is a responsible or fair solution. AND it will make the coveted free spots even more coveted, causing MORE traffic circling, not less. It’s simply a money grab by vested MTA self-preservation budgetary interests, and NOT in the public interest. Earthstepper – I ride the 48 bus and it gets stuck behind double parked traffic when the meters are off on 24th street. Start charging for meters and the double parking goes down. That would make my life EASIER. And I am a resident. FTFY: It’s basic economics, make something free and people will abuse it. Charge for parking, get needed turn over, businesses will see more customers. Residential areas still have RPPP and the residents still have ability to park near their homes. I totally agree with fsinsf. It is residents who will get screwed by this proposal to make us pay for Sundays. How far are we from no residents allowed to have cars unless we have off-street parking. Too bad the working poor always takes the punishment from this so-called “progressive” attutude by the MTA. When are they going to learn that such agencies are not in business to make money just as with schools. They are a SERVICE agency. I liked it better when the cops ran parking control and MUNI was on its own.